If I had been called for jury duty on Abel Tasman National Park, I would have had to decline, since I had heard so much about it in advance. The most beautiful part of New Zealand. You have to spend at least three days doing the track! The section in the middle is the best! The weather was perfect, the boat ride smooth. 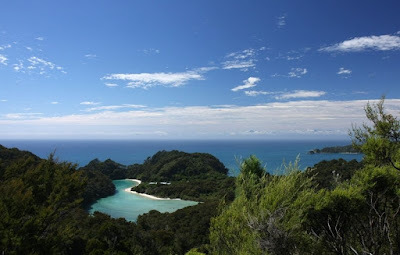 After about an hour, we got off the boat to walk the middle part of the Abel Tasman track. It was outright surreal. Every now and then I had to touch a few plants, just to make sure I was not in some Disneyland outstation. There was this really neat track, stenciled into the native forest. A forest where virtually all the plants look as if they were taken straight from some botanical garden, only more natural and with greater variety. Through the trees, wonderful golden beaches and secluded bays were visible. And in crass contrast to Disneyland where the ride ends after 5 minutes, it went on for hours. 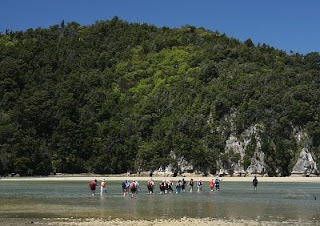 Everyone goes to Abel Tasman, so we were not exactly alone, but even with the large number of people on the move, we did not meet all that many other people. Maybe most were moving in the same direction as we were. At the end of our track there was a shortcut across a bay. It was only accessible when the bay emptied at low tide. While we were sitting at the beach, waiting for the water to drain, there was this group on a guided tour who did not want to wait that long. Almost biblical.